THE LEGAL AID SOCIETY OF COLUMBUS is Central Ohio's oldest and largest general civil legal services organization. Since 1954, Legal Aid lawyers have been PURSUING JUSTICE AND CHANGING LIVES. For many low income and elderly individuals living in Columbus and Central Ohio, equal justice under the law is not an abstract concept or a phrase with no meaning, it is an every day struggle to provide for themselves and their families. The Legal Aid Society of Columbus (LASC) exists to provide assistance and guidance to those attempting to navigate our complex legal system. Our attorneys know that without proper representation, justice can be difficult to come by and it is the mission of LASC to improve the lives of low income residents and senior citizens of Columbus and Central Ohio by providing high quality legal representation that meets our clients’ civil legal needs. 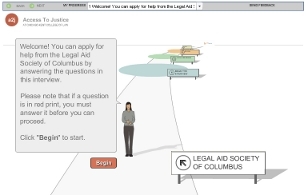 In order to qualify for services at The Legal Aid Society of Columbus, you must meet income and resource limits. The intake staff here at LASC will answer any questions that you may have about your eligibility and will assist you by finding an attorney in our office able to help resolve your problem. Although the Legal Aid Society of Columbus does provide services free of charge, you may be required to pay for certain court costs. If you have a problem that is not discussed on our website, please do not hesitate to call our office; we may provide a service that can help you or we may direct you to a program, agency or private attorney who will be able to assist you. Click here or on the picture above to get started. When you have completed your online application, please only click on SUBMIT one time. It takes a few seconds for the process to complete. Please note that this application does not work with mobile devices. Our intake phone lines are open Monday-Friday 9:30-3:30. Call (614) 241-2001. © 2016 The Legal Aid Society of Columbus. All rights reserved.